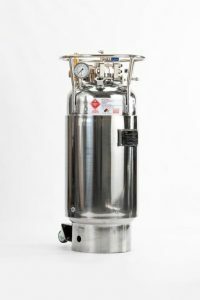 Here at Anion we constantly strive to push the envelope with new ideas and creative innovations, and our newly designed 100lb ASME U-Stamped Pressure Vessel is no exception. This Pressure Vessel features an external jacket as well as an internal coil for circulating cooling from our Julabo Chillers throughout. This helps keep the solvent at sub zero temperatures for better, cleaner extraction process as well as lowers the head pressures in the Vessel for faster recovery from our two Goliath pumps. Average pressure when running our system at max is generally 0-30psi. 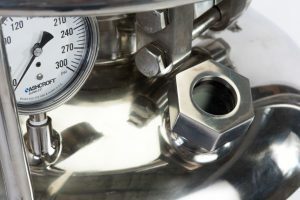 Since we’re able to maintain such low temperatures and pressures inside the vessel, we have incorporated an additional auxiliary port to the top of the tank for inert gas assist (nitrogen assist). This is used to help pressurize the head of the tank and force the liquid out through the siphon tube when filling the columns. To keep an eye on the process we’ve mounted a sight glass to the Vessel to allow you to maintain a visual on the liquid levels of your solvent as well as monitor for any possible contamination. 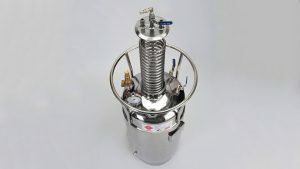 In the event there is contamination the 6″ lid is fully removable for cleaning. And the interior and exterior of the tank have a sanitary mirror finish to make cleaning simple and thorough. During our study process one of the things that we commonly noticed among extraction artist was trans filling inside the buildings despite governing laws prohibiting this. This was mainly because with many units it is simply easier to bring the bulk bottles inside vs disassembling the extractor to bring the pressure vessels outside. Not only is this a potential safety hazard, in many cases it’s against the law which can carry stiff penalties to the owners if employees do not follow proper procedure. Anion has designed a simple yet effective means to transport the cylinders outside with rolling casters fixed to the base of the unit. 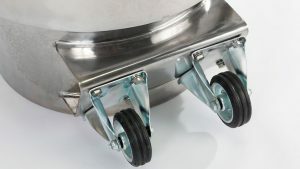 The casters do not contact the ground when upright in the normal resting position but allow for the Pressure Vessel to be tipped onto them much like using a wheel dolly. Simple, elegant, and effective. Another first in the industry brought to you by Anion.